1993 plans Brewer, coque aluminium, 20t. mat de 30m. 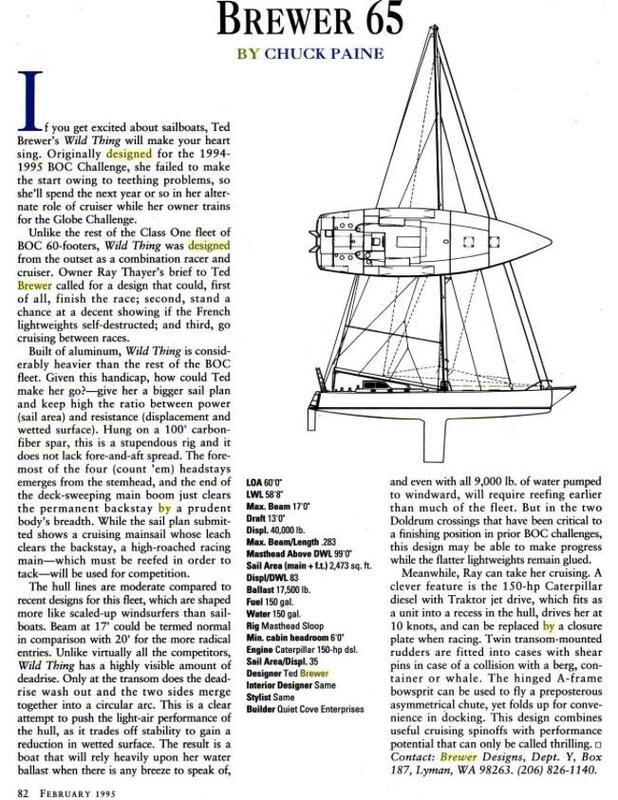 "Bill Cook took a hull designed by Rejean Desgagnes of Quebec and finished the design for Chris Beirne's entry into the Around Alone race, formerly known as the BOC. 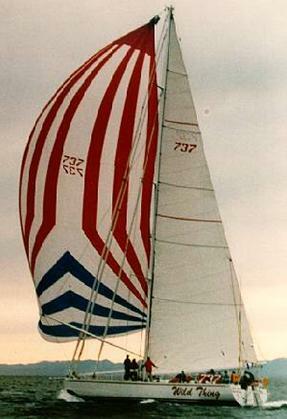 The boat is typical of the breed in that it is a big, dinghylike hull with ultralight displacement and exaggerated beam, twin rudders and water ballast. The rig is huge, draft is 12.5 feet and the boat appears capable of extremely high speeds in the hands of the right sailor. 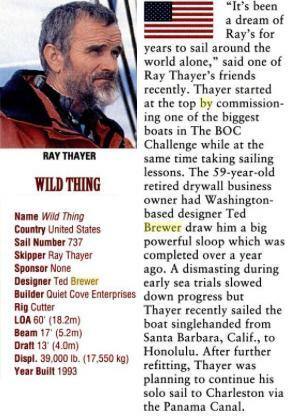 In the words of Arlo Guthrie, ÒBut, that's not what I came to talk about Ó Ray Thayer's Brewer-designed Around Alone boat Wild Thing just sank off the Washington coast. Ted Brewer and Ray Thayer worked hard together to produce a very different Around Alone-type boat heavier and more moderate in its proportions. The 60-footer was doing double-duty as a cruising yacht. Mr. Thayer, through truly heroic efforts, managed to save himself but lost his boat. Reports indicate the boat was close reaching in 30 knots of wind under double-reefed mainsail and blade jib. There was about 4 tons of water ballast in the weather-side tanks. A 50-knot puff hit, rounding the boat up to weather. The rudder went hard over to counteract the round-up and the rudder blade stalled. The boat went head to wind and then tacked itself, leaving the jib sheeted to weather and the 4 tons of water ballast now on the leeward side. The boat heeled to about 105 degrees. Basically, water poured in through the open Dorades (added by the owner) and swamped the boat, which quickly foundered. The downside (no pun intended) of water-ballasted boats needs to be pondered. I look at this Cook-Desgagnes design-with its wide beam, 13,500 pounds of displacement (D/L 48.24) and lead ballast of 3,300 pounds-and I wonder why the same catastrophe could not happen to this boat. The two areas to consider are the skill of the crew-and when the crew is one person, you have to include a heavy factor for fatigue and lapses in judgment due to fatigueÑand the stability characteristics of the boat. We could also open the Pandora's box of the ability of autopilots to steer in severe conditions..."